Nearly one-third of the 61% of total global petroleum and other liquids production that moved on maritime routes in 2015 transited the Strait of Malacca, the second-largest oil trade chokepoint in the world after the Strait of Hormuz. 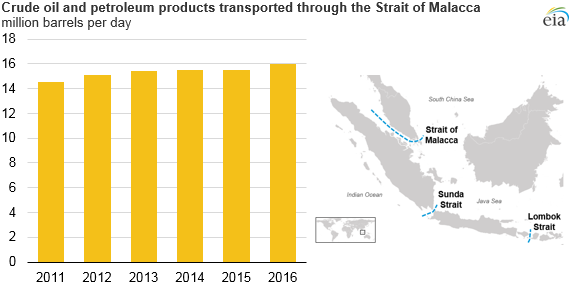 Petroleum and other liquids transiting the Strait of Malacca increased for the fourth time in the past five years in 2016, reaching 16 million barrels per day (b/d). The Strait of Malacca, which flows between Indonesia, Malaysia, and Singapore, connects the Indian Ocean with the Pacific Ocean through the South China Sea. It is the shortest sea route between Persian Gulf suppliers and key Asian markets. Oil shipments through the Strait of Malacca supply China and Indonesia, two of the world's fastest growing economies. 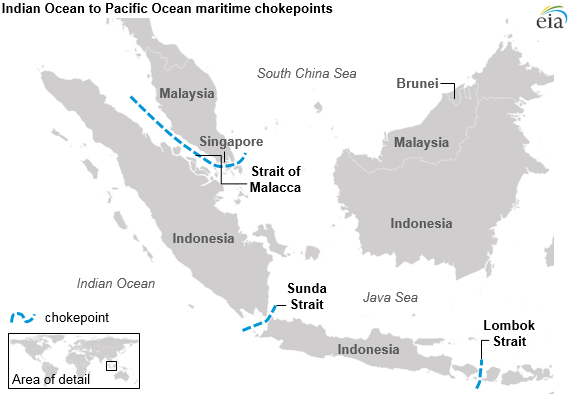 The Strait of Malacca is the primary chokepoint in Asia, and in recent years, between 85% and 90% of annual total petroleum flows through this chokepoint were crude oil. The Strait of Malacca is also an important transit route for liquefied natural gas (LNG) from Persian Gulf and African suppliers, particularly Qatar, to East Asian countries with growing LNG demand. The biggest importers of LNG in the region are Japan and South Korea. At its narrowest point in the Phillips Channel of the Singapore Strait, the Strait of Malacca is only about 1.7 miles wide, creating a natural bottleneck with the potential for collisions, grounding, or oil spills. According to the International Maritime Bureau's Piracy Reporting Centre, piracy, including attempted theft and hijackings, is a threat to tankers in the Strait of Malacca. If the Strait of Malacca were blocked, nearly half of the world's shipping fleet would be required to reroute around the Indonesian archipelago, such as through the Lombok Strait between the Indonesian islands of Bali and Lombok or through the Sunda Strait between the Indonesian islands of Java and Sumatra. Rerouting would tie up global shipping capacity, add to shipping costs, and potentially affect energy prices. Several proposals have been made to increase bypass options and reduce tanker traffic through the Strait of Malacca. In particular, China and Myanmar (Burma) commissioned the Myanmar-China natural gas pipeline in 2013 that stretches from Myanmar's ports in the Bay of Bengal to the Yunnan province of China. The oil portion of the pipeline was completed in August 2014, and it is now operational at full capacity.